Use your iPad to take the Road Trip Challenge! 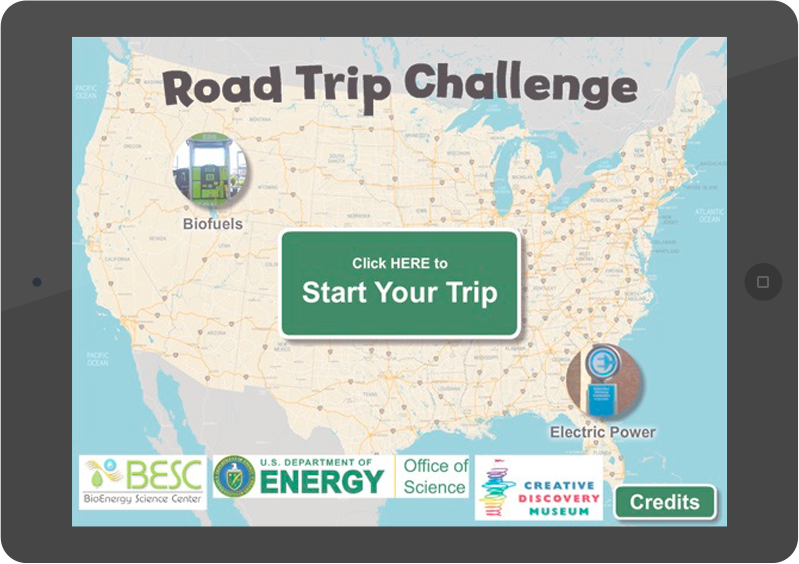 Road Trip Challenge teaches strategies for wise energy use. Students choose and customize a vehicle, then select types of fuel and travel to familiar destinations across the country. The game also also incorporates lessons to explore fuel efficiency, availability, and environmental impact resulting from choices that are made during different legs of the game. The Road Trip Challenge (RTC) app is currently available for use on Apple iPad’s only, but additional operating system platforms for the app will hopefully become available during 2016. Download the free iPad-app at the Apple App Store today. Road Trip Challenge can also be used in interactive kiosks in museums and other educational venues. Ask about how your facility can obtain a kiosk for your exhibit area. To see a kiosk in action, visit the Creative Discovery Museum. Now Available for Download: Legs 4 and 5 of Road Trip Challenge! Legs 4 and 5 of the iPad app Road Trip Challenge have been added to the Apple, Inc. iTunes store. Download or update your app today to see the new content! Each leg of the Road Trip Challenge takes you on a different journey across the country and focuses on different aspects of science and engineering. Click on any leg for additional curriculum, hands-on activities and links to enhance learning.